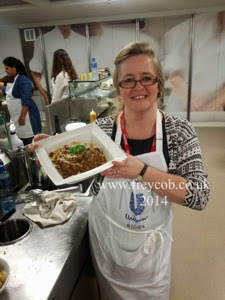 I was one of 12 food bloggers to attend a rather special event at the Unilever headquarters in Leatherhead, Surrey on 13th October. After an early morning start, 2 trains, the Underground and 3 hours later, myself, along with the other bloggers, were met by minibus at a very wet and rainy Leatherhead station for the short transfer to their impressive building. The atrium at Unilever opens to reveal a light and airy space complete with hairdressers, Ben & Jerry’s Ice Cream lounge and Unilever staff shop which you can’t fail to be impressed with. We were met by the Clarion Communications team and taken into the kitchen where pastries, tea and coffee awaited our arrival as we dried out from the rain. We were treated to a talk on the history of Tea by Jane Pettigrew. Who knew that servants were paid in tea as part of their wages as it was so expensive originally?! I’ll write up a few of these interesting facts of tea in a separate post for you soon. We were taught to taste tea, which teas should be served with or without milk, what temperature your water should be at for the various types of tea, and where the teas come from in the world. We were also given the history of PG Tips from inception in the 1930’s through to today and what we see on our supermarket shelves to buy and enjoy. Oh, and guess who got caught taking a sneaky photo of Chef? Yep, me! His reaction? ‘Madam, if you’re going to take a photo, let’s do it properly and do a selfie!’ What a gent! We were then split into pairs to prepare lunch under the guidance and critique of Marco. Teams cooked Risotto al Funghi, Curried Parsnip Soup, Bruschetta with Tomatoes and Herbs, whilst my team-mate Layla and I cooked a simple bolognese sauce. Our afternoon was completed with a talk and demonstration by Sue Batty, the Stork expert. We were then invited to choose our flavourings and make our own batch of cupcakes to take home with us. the 7 of us on the train back to London had a bit of a cake swap! My fellow bloggers were Kirsty (Hijacked by Twins), Lucy (Supergolden Bakes), Amy (She Cooks She Eats), Leyla (Motherhood Diaries), Dominic (Belleau Kitchen), Agata (Barktime), Fiona (London Unattached), @GlutieBaker, Jack (koukouvaya), Manjiri (Slice Of Me) and Heidi (Heidi Roberts Kitchen Talk). Thank you to the Unilever Kitchen, Jane Pettigrew, Marco Pierre White, Sue Batty and to Clarion Communications and all my fellow bloggers for a fantastic event. A very long day for me with 6 hours spent travelling but a lovely day too. Thank goodness for the trains so I could sit and chill out on my journey home with Monkey to keep me company!